MV Werften laid the keel today for Crystal's first two newbuilds for their river cruise line, Crystal Bach and Crystal Mahler. The “Rhine Class” ships will be for use on the Rhine, Main and Danube Rivers. The line already began service in July with a refit ship, Crystal Mozart. 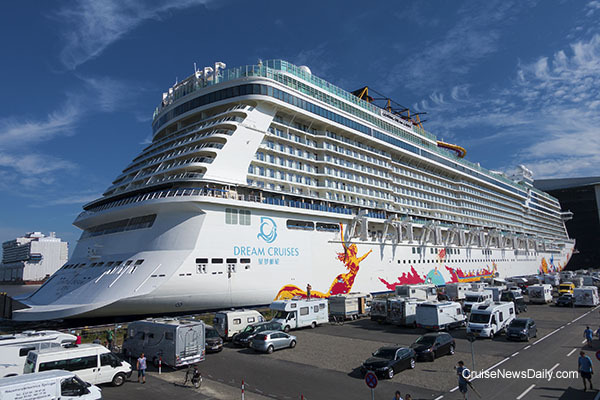 If you were planning to watch the float out (undocking) of Genting Dream on Saturday morning at Meyer Werft, don't. It is already out. The yard decided to do it a day early due to weather forecasts of high wind gusts on Saturday. 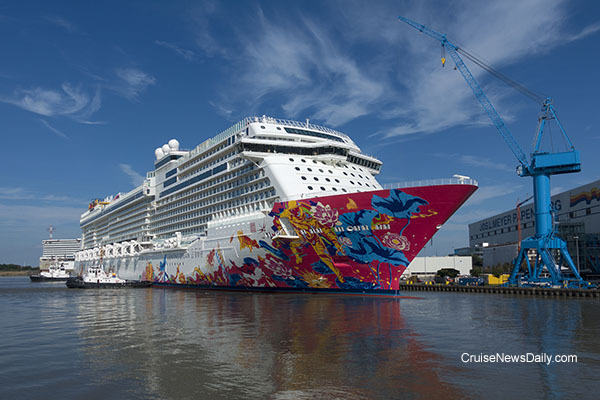 The 151,300-ton Genting Dream was floated out of Meyer's covered building dock a day early. The Jacky Tsai hull art can be seen in its entirety for he fist time. A section of Norwegian Joy can be seen in the background. The ship's stack can be seen on the pier awaiting attachment. Photos courtesy of Meyer Werft. May not be copied or used without permission. 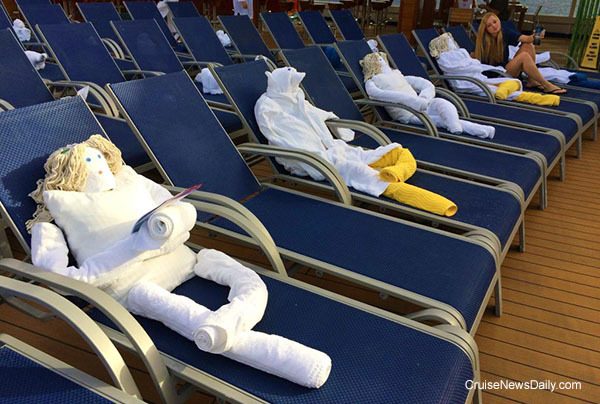 The creativity of the housekeeping team aboard Carnival Magic as they went from towel animals that everybody makes, to the first towel people. Photos are below. 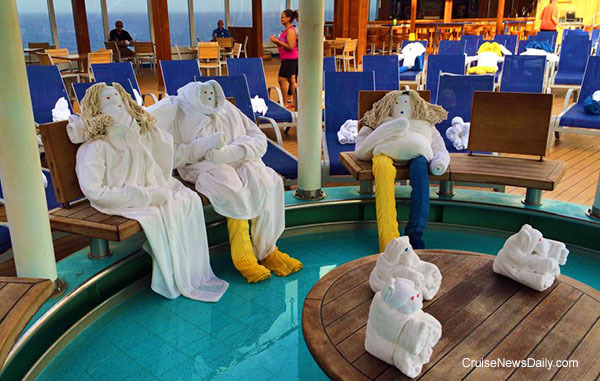 Photos courtesy of Carnival Cruise Line. May not be copied or used without express permission. Queen Mary 2 returned to service a couple weeks ago after a month being “remastered” in a German dry dock. Cunard has produced a video that gives us an overview of the process and then a look around at the stunning finished product, now back in service and regularly crossing the Atlantic. Many general news media outlets were this morning reporting that a cruise ship was afire and being evacuated off the coast of Puerto Rico. It wasn't a cruise ship. It was a Panamanian-registered ferry named Caribbean Fantasy carrying 512 passengers, cargo and a crew of 26. Meyer Turku cut the first steel for TUI Cruises Mein Schiff 1 yesterday at their yard in Turku, Finland. Yes, TUI just put Mein Schiff 5 into service, but the steel was cut for Mein Schiff 1. Just as other cruise lines reuse favorite names, apparently TUI intends to reuse favorite numbers. The line is replacing both Mein Schiff 1 and Mein Schiff 2 with ships of the same name, and the originals will be handed off to TUI's UK brand, Thomson Cruises. MSC Cruises is preparing for their next phase of growth in the North American and Caribbean market with some executive changes of the people at the top. Carnival Corp has signed a five-year extension to their contact to sail from Port Everglades. Today's extension builds on the landmark 15-year agreement signed in 2010, which now secures the company's presence at the port at least through 2030. After more than three years of planning and preparation, Crystal Serenity sailed from Seward, Alaska, today on its 32-day voyage to New York via the Northwest Passage, around Alaska and its north shore and along Canada's frigid northern coast. With almost a thousand passengers aboard, they will certainly have a unique adventure to look back on the rest of their lives. Meyer Werft is planning to float out Genting Dream from their giant indoor building dock on Saturday (August 20). This will be the second ship they are completing this year. The process is scheduled to begin at 8:00am, local time in Germany (2:00am Eastern time in the US). Once the ship is docked at the finishing dock on Saturday afternoon, the stack will be attached. On Sunday, there will be thruster tests and lifeboat launching. During the following weeks, the ship's interior will be completed. A mid-September river conveyance is planned. The exact date will be chosen late. 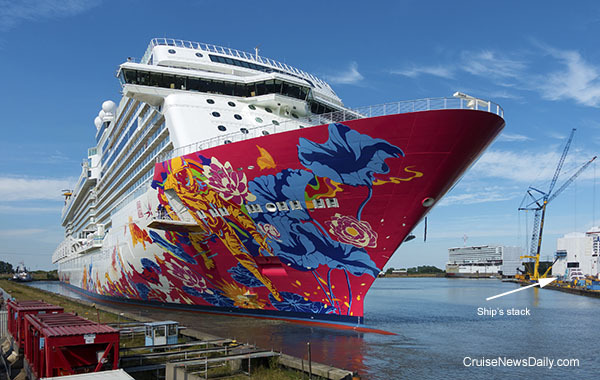 The 151,300-gross ton ship will be the first ship in the Dream Cruises fleet, and it will be based in China. This article appeared in the August 16 edition of Cruise News Daily. A 31-year-old Chinese woman fell overboard from Royal Caribbean's Mariner of the Seas last Wednesday evening (August 10) about 9pm while it was traveling from Japan back to its home port of Shanghai. The unusual ending to this story is that she was rescued by another ship about 38 hours later. Carnival Cruise Line has extended their contract to continue sailing from the Port of Baltimore through December 2018 with three one-year options. The service will continue to be with Carnival Pride. The mother of US Olympic volleyball player Carli Lloyd flew into Rio, dropped off her suitcase at Norwegian Getaway where she was staying (the ship is docked in Rio for use as a hotel by US team members and guests), and thanks to delayed flights, had to rush right to the stadium to see her daughter play. A bomb-sniffing dog alerted on Cindy Lloyd's suitcase before it was put aboard the ship, so as a safety measure, it was blown up (the suitcase, not the dog). 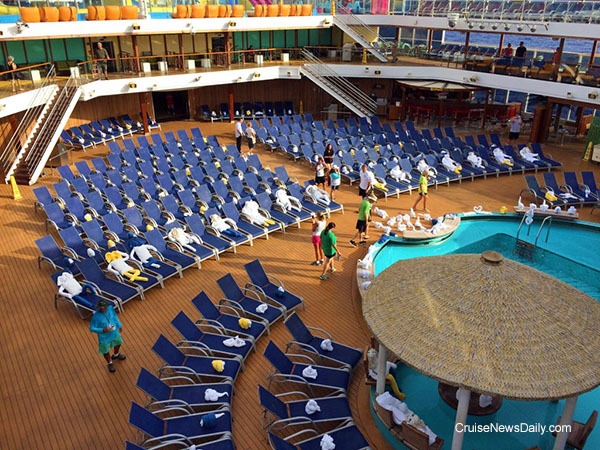 The complete story appeared in the August 15 edition of Cruise News Daily.